The art style of Emily and the Strangers is bright and vibrant, which fits the tone of the comic perfectly. 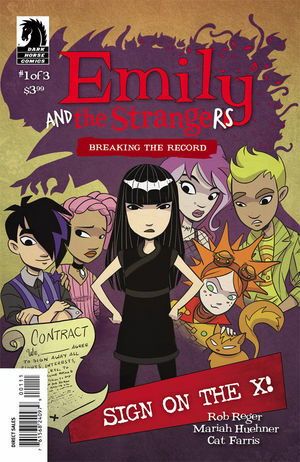 The comic is a spin-off of Emily the Strange and focuses on her band. This is the first in a three-part mini-series. Of the six main characters, four of them are girls, and one is even a ROBOT girl! There’s also a set of twins who are people of color. I really appreciate the diversity of this comic. Issue #1 sets the stage nicely for both a sinister record company scheme and a puzzling number of stray cats, which may or may not be related. This is a great comic for all ages, and I’m looking forward to the next two issues!